Sarah Kate and her family of 5 recently moved into a charming cabin in the woods. Plantation shutters for the living and bedroom fit with her minimalist style, brightened up the space, and were a safer cordless choice for her kids. Sarah Kate Branine writes at a site of the same name (formerly Cranny + Me). She’s a wife and mom of three that uses her blog as an online journal of her work and life. Readers will find home decor, lifestyle and crafts on her beautiful blog. Sarah Kate chose Simplicity Wood Shutters to cover the windows of her living and bedroom. 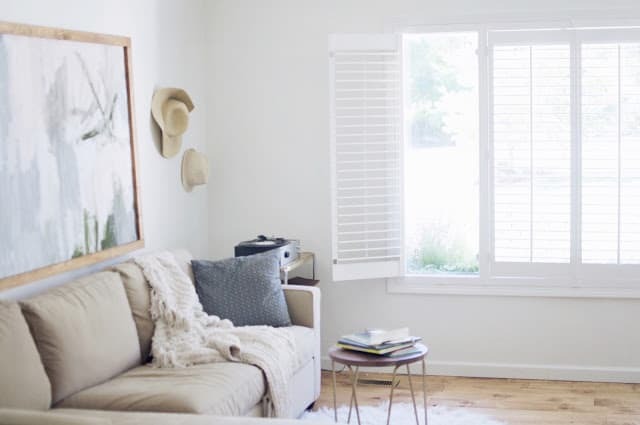 Rather than bulky curtains, these wood shutters give full light control and offer clean lines to fit with Sarah Kate’s minimalist style. Not only do the shutters complete Sarah’s room from the inside, but they offer great curb appeal too. When my dad and my husband installed Blinds.com’s shutters I nearly cried. They are beautiful, and not just from the inside but also looking in from the outside. When I think about the most beautiful parts of our home (to me anyway), these shutters most definitely come to mind. These shutters have 2 louver sizes and allow up to 6 panels that can open or close in any direction. They’re also completely cordless, which keeps her kids safer. My favorite way to style them is one open here, one open there, and the middle section propped open. They allow all the light my heart could desire and at night they button up to allow our family top-notch privacy. Sarah chose Simplicity Wood Shutters in the color Off-White. To learn more about Sarah’s living and bedroom makeover, be sure to check out her posts: Our Home | Part One and Our Home | Part Two. I am so sorry that I am just now seeing this! We love these shutters so much. Thank you for such a kind post!